This is a three-legged tall pot, a shape the Chinese call Li. It is made from a brown clay which is charred black.I could see the coarse brown clay because one foot was broken. The charring was almost a centimeter deep. It is a heavy piece and it is 24,5 cm high. It has been crudely restored, and misses one piece of the rim. The black is burnished smooth on places. In the inside there are traces of roots. There are several cracks and breaks. It is from the Xiajiadian culture,(2200-1600 BCE); a bronze age culture in the north of China. They are referred to as cooking vessels, placing them directly in the fire/sinters. These vessels were not wheel-turned, but build up with clay and then scraped to a pleasing form. There were some plant roots still remaining in the inside. 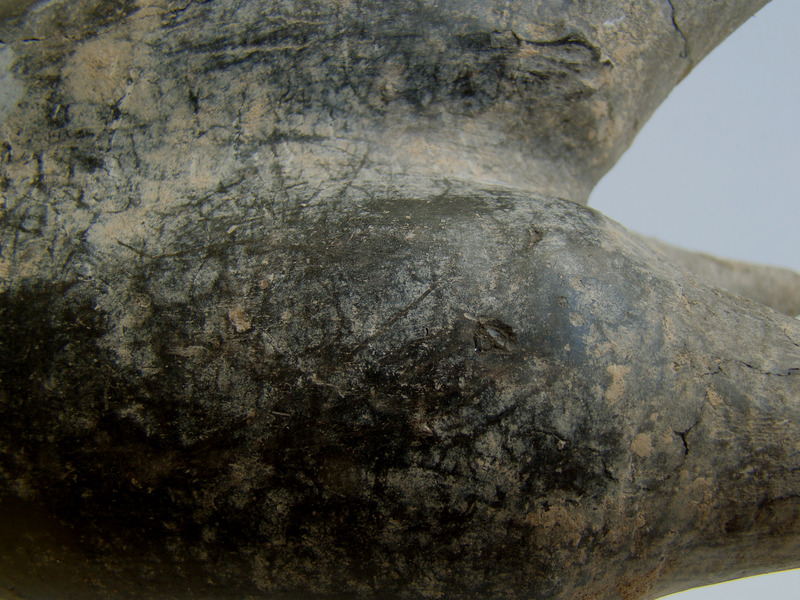 The body shows the typical markings of an ancient piece. In my opinion a stunning piece, both visually and historically.